If you don’t already know, garlic scapes are the green shoots of garlic that need to be clipped backed in May or June so as not to exhaust the developing garlic bulb beneath. They taste quite garlicky, but with less of the pungency and sharpness of regular garlic. 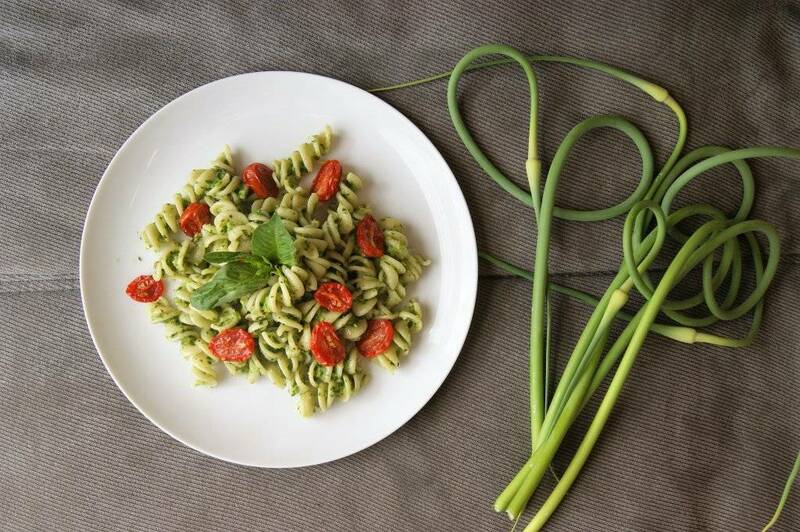 I’ve previously talked about my love for garlic scapes here, and included several recipes for using them. Garlic scapes can be used as a replacement for garlic in various dishes, but I find that it’s hard for me to use them up this way (honestly, I get so many scapes!). 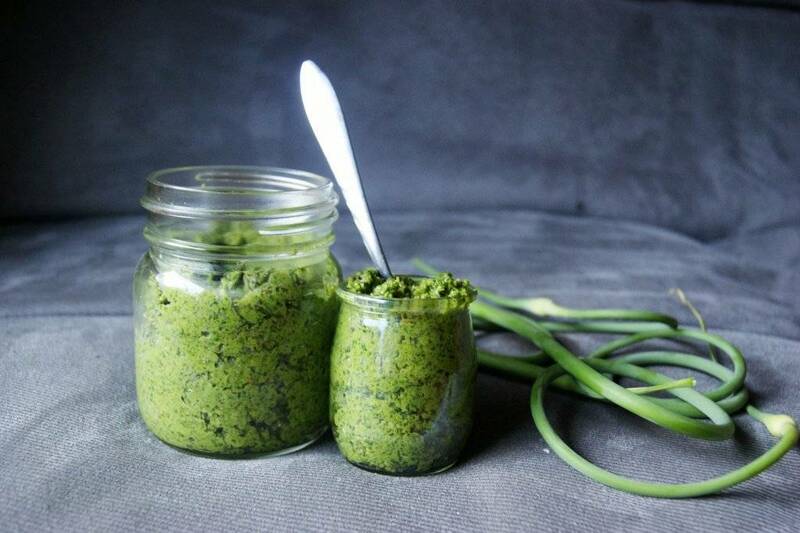 Enter pesto, which uses a lot of scapes in each batch, AND tastes amazing. 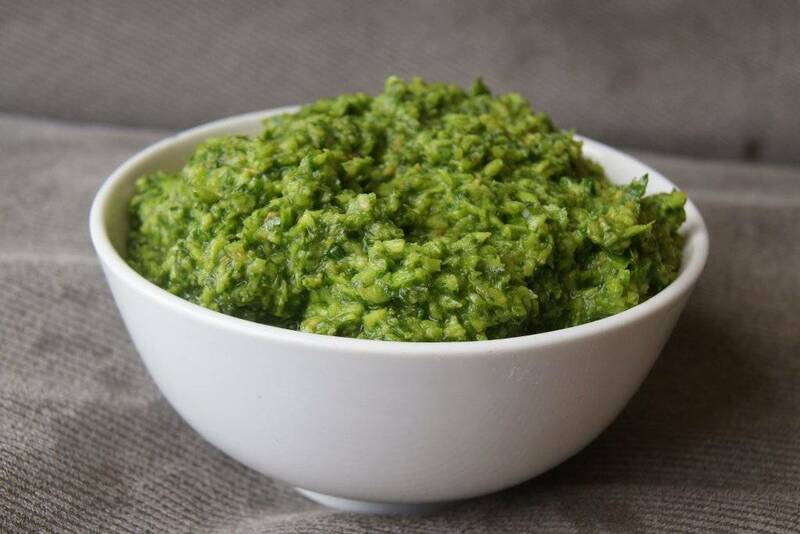 I love this recipe: it makes a delicious pesto, on the mild side in terms of both garlic, but full of herbaceous flavour, making for a rounder pesto which I find works beautifully in all kinds of recipes. 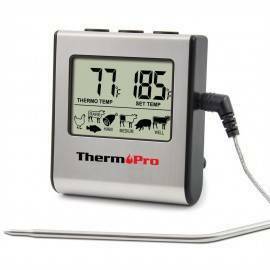 It’s quick to make, freezes beautifully, and can be used in a variety of dishes, vegetarian or meat-based. I’m thrilled to have some packed away in the freezer. This makes a delicious pesto, on the mild side in terms of both garlic and basil, making for a rounder pesto which I find works beautifully in all kinds of recipes. For a stronger basil flavour, substitue all or part of the parsley leaves for more basil. Pesto is a flavourful and versatile ingredient, wonderful to have on hand. 1. 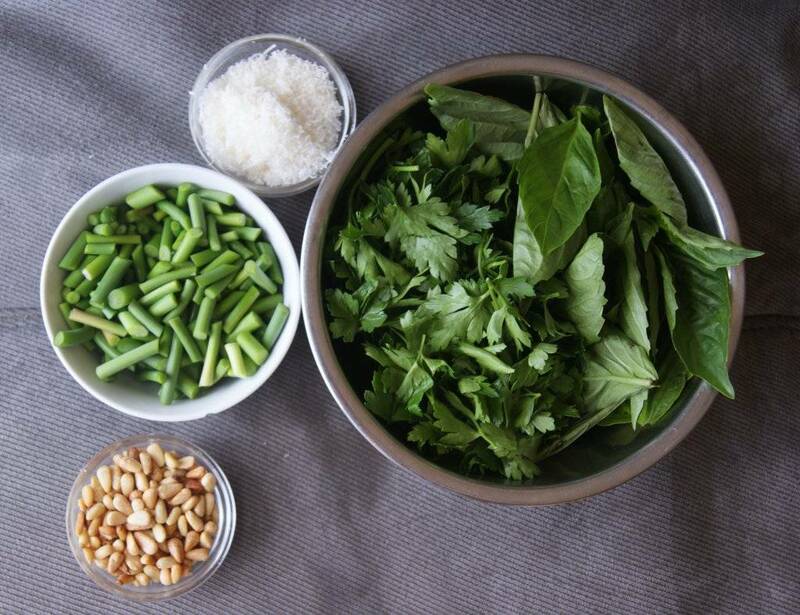 Place the prepared garlic scapes, herbs, nuts, cheese, salt, and pepper in the work bowl of a food processor. 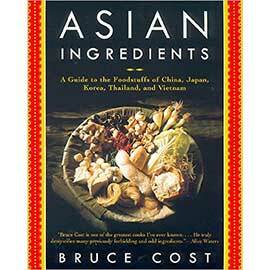 Process until the ingredients are finely chopped, stopping to scrape down sides as necessary. 2. Now, with the machine running, pour the oil through the feed tube until pesto comes together in a bright green puree. 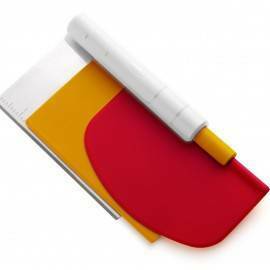 Stop to scrape down the sides as necessary. use more olive oil, if necessary, to achieve your desired consistency. 3. 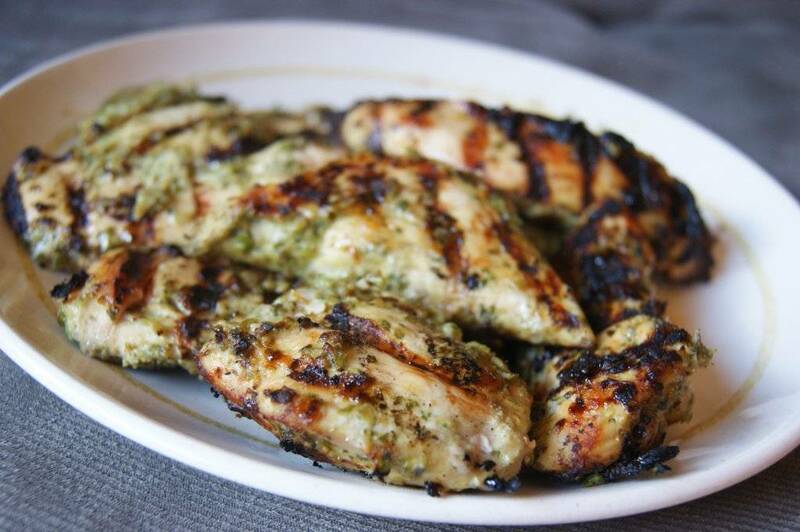 Taste the pesto and add lemon juice and/or salt as desired. 4. Pesto can be kept refrigerated up to 10 days, or frozen up to 6 months. 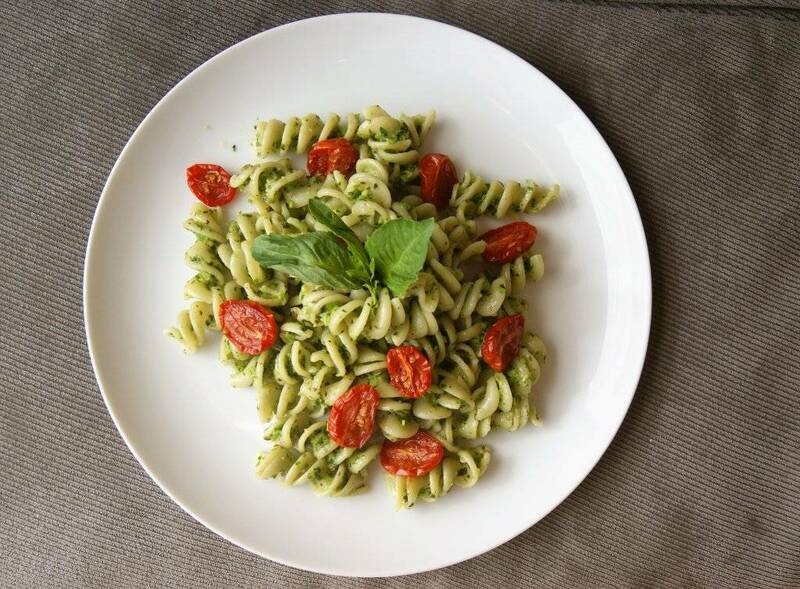 USES: the classic way of using pesto is to toss a generous amount of it with freshly cooked pasta or potato. It also tastes wonderful used as a pizza topping or sandwich spread, as a garnish for bean or vegetable soups, or as part of a salad dressing or meat marinade. That’s too bad! :( I find it’s best to use younger, smaller scapes, and don’t use them if they are thick and tough. 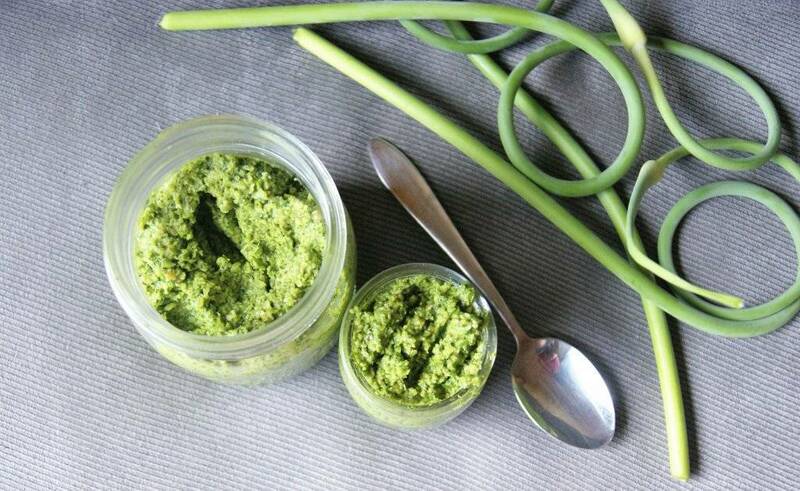 Garlic scape pesto will have a rougher texture than regular pesto, but it shouldn’t be tough. I hope it works out better this year!